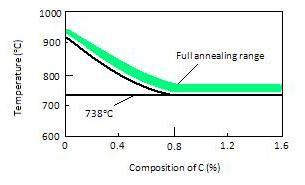 The annealing temperature is one important heat treatment parameter. What are the other important parameters for annealing of copper, steel, aluminum and similar materials? The article will discuss them all. Types: Many classifications are used across the industry. Two important categories among them are: process and Full annealing. The first one is the softening the material in between some forming process (like cold rolling). The aim here is to remove the hardness generated due to the forming process so that while performing the further cold working operation the material should not break. The second one is performed before starting the cold working process itself to make the material soft enough to shape in a cold working process.